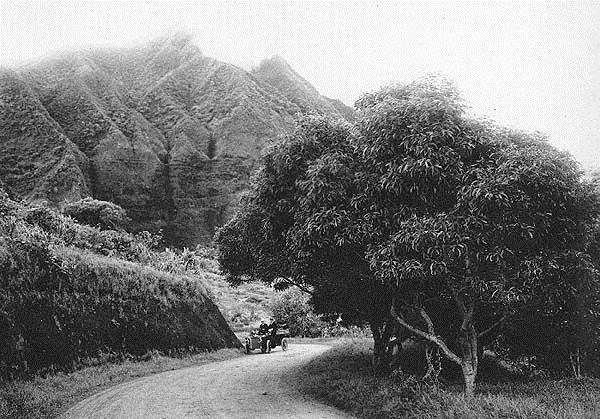 A story is told in the legend of two children who lived on two hills, one in Nuʻuanu and one in Kalihi. The boy would visit his playmate on the neighboring hill. When the girl’s godmother, who was the mist of the valley, saw how happy this made the girl, she enveloped the boy in a mist so he could not leave and return home. The boy’s parents thought that the boy was dead and went on with their lives. However, the parents angered the “Lady of the Ferns” a goddess of Kalihi Pass, when they collected lehua, sacred to this goddess, for their lei and forgot to make an offering. The goddess summoned a horrendous storm to strike the family on its hill. The cries of his family woke the boy from his spell and he tried to return home, but the lady created a great wind that picked him up and killed him. When the boy did not return, the girl began to weep. At normal times (with typical tradewinds,) the falls only appear after a rain, and the water from the falls never reaches the base of the cliff; it is “blown” up by the winds and “in midair, it suddenly changes its course and rises upward to a cloud of mist”. The image shows Waipuhia (on a rain-free day,) above and behind the car (early-1900s.) In addition, I have added other related images in a folder of like name in the Photos section on my Facebook and Google+ pages.